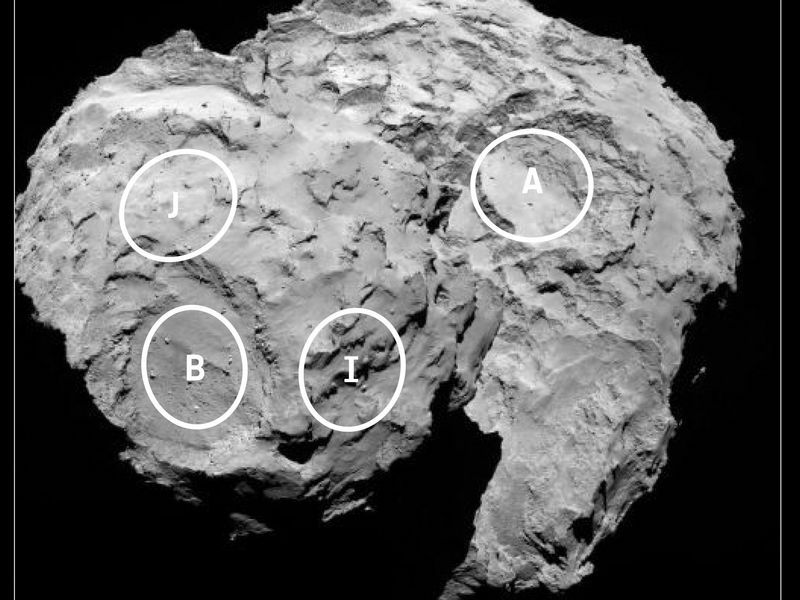 This annotated image depicts four of the five potential landing sites for the Rosetta mission's Philae lander. 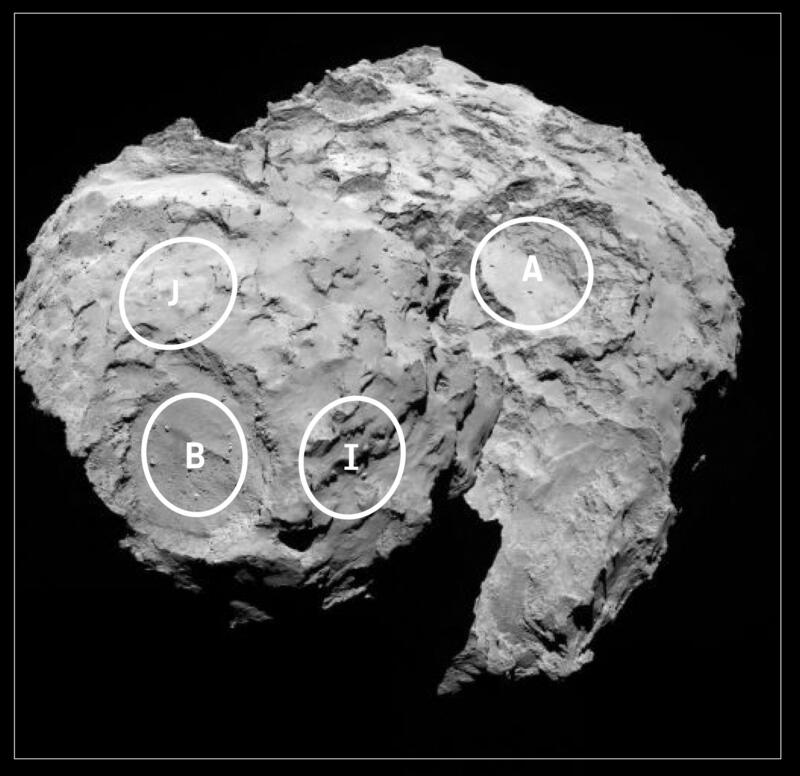 Five candidate sites were identified on Comet 67P/Churyumov-Gerasimenko during the Landing Site Selection Group meeting held August 23 - 24, 2014. The approximate locations of the five regions are marked on these OSIRIS narrow-angle camera images taken on August 16 from a distance of about 62 miles (100 kilometers). The comet nucleus is approximately 2.5 miles (4 kilometers) across. Each elliptical landing site covers about four-tenths of a square mile (one square kilometer). The sites were assigned a letter from an original pre-selection of 10 possible sites identified A through J. The lettering scheme does not signify any ranking. 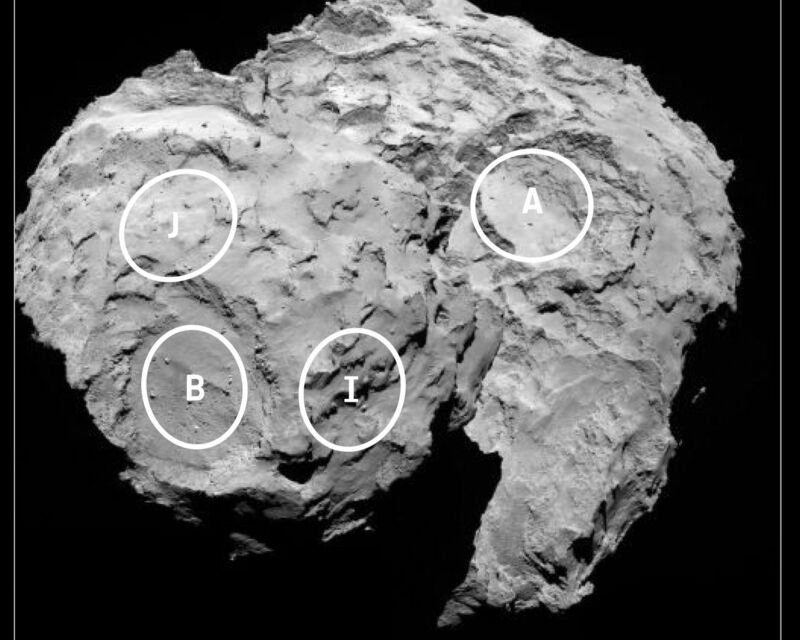 Three sites (B, I and J) are located on the smaller of the two lobes of the comet, and two sites (A and C) are located on the larger lobe. Choosing the right landing site is a complex process. 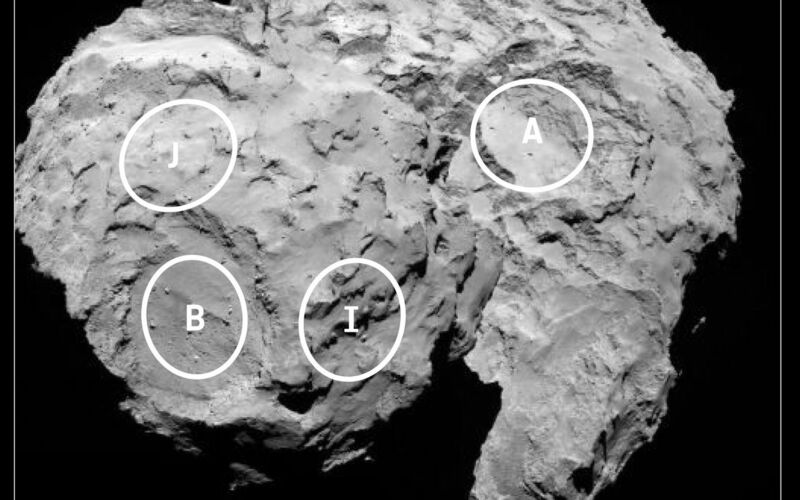 That site must balance the technical needs of the orbiter and lander during all phases of the separation, descent, and landing, and during operations on the surface with the scientific requirements of the 10 instruments on Philae. The scientific imaging system, OSIRIS, was built by a consortium led by the Max Planck Institute for Solar System Research (Germany) in collaboration with Center of Studies and Activities for Space, University of Padua (Italy), the Astrophysical Laboratory of Marseille (France), the Institute of Astrophysics of Andalusia, CSIC (Spain), the Scientific Support Office of the European Space Agency (Netherlands), the National Institute for Aerospace Technology (Spain), the Technical University of Madrid (Spain), the Department of Physics and Astronomy of Uppsala University (Sweden) and the Institute of Computer and Network Engineering of the TU Braunschweig (Germany). OSIRIS was financially supported by the national funding agencies of Germany (DLR), France (CNES), Italy (ASI), Spain, and Sweden and the ESA Technical Directorate. Rosetta is an ESA mission with contributions from its member states and NASA. Rosetta's Philae lander is provided by a consortium led by the German Aerospace Center, Cologne; Max Planck Institute for Solar System Research, Gottingen; French National Space Agency, Paris; and the Italian Space Agency, Rome. JPL, a division of the California Institute of Technology, Pasadena, manages the U.S. participation in the Rosetta mission for NASA's Science Mission Directorate in Washington.